The June 2015 Oregon Regional Economic Indexes of was released today. Full report is available here. We thank KeyBank for their generous support of this project. Most regions in Oregon are growing at or above their average pace of activity; the Rogue Valley is an exception, although that appears to be attributable to unusual data behavior. Labor force weakness dragged down the Rogue Valley measure, likely leading to an understatement of underlying activity in the region. Watch for revisions or upward correction in the measure. Recall that “zero” for these measures indicates relative average growth; each region has its own underlying growth rate. Housing permits contributed positively in the Portland measure while having a neutral impact on the Central Oregon measure. Permits were a negative factor in remaining areas despite very strong performance in residential home sales. Although residential construction is generally stronger, in many regions it remains below normal levels. Portland’s measure jumped to well above average, supported by a large gain in the trade, transportation, and utilities employment component. 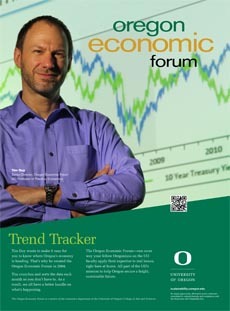 Moderating job growth has been a primary factor in the softening of the Central Oregon measure. The Eugene-Springfield measure rebounded; the moving average measure, which smooths monthly variability, signaled slightly above-average growth. The Salem measure indicates the region continues its steady acceleration.